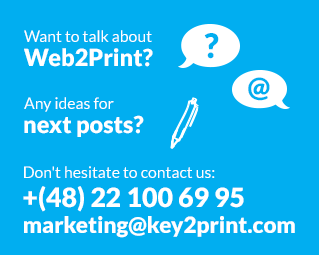 Key2Print – what actually is it? Outsourcing marketing services. Why it is better to trust professionals ? How to find your niche market in the printing business ? – Blue / red ocean. How to keep visitors on your website? Who is Web to Print for? Become an expert on Web To Print. On our blog you will find the most important and recent information on Web To Print system. Experts from Key2Print share their knowledge and experience on how to lead a printing house on-line.